The Bernie Sanders 2016 campaign store is telling prospective buyers to "allow 2-3 weeks for delivery" of a T-shirt with the Bernie 2016 logo. A Sanders fan might say that this shows the high demand; they're essentially sold out and need to re-order. A Sanders skeptic might say that this is what you can expect under the Sanders policy prescription of socialism and protectionist isolationism on trade. 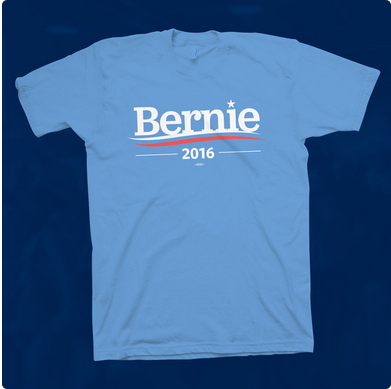 The official Bernie Sanders 2016 campaign T-Shirt. Expect to wait 2-3 weeks for delivery. The T-shirt is "union-made and printed in the USA." Under socialist protectionist isolationism, products are made in America, which is good for a few unionized textile employees. But the result is that the shelves are bare, and consumers have to wait weeks to obtain the products they actually want. Want to know why capitalism is better than socialist protectionism? Go to Amazon.com and search Bernie Sanders 2016 t-shirt. You get 1,500 results, in-stock and available for delivery in one or two days.